Seth Weil Academy teaches Bruce Lee’s art of Authentic Jun Fan Jeet Kune Do, a simple, direct and effective martial arts and self-defense system developed by Bruce Lee based on the principle of intercepting. Classes are taught in small groups of no more than 6 people at a time to give you a more personal training environment, a concept that goes back to SiJo Bruce Lee’s training philosophy. Classes are offered twice a week and you can choose what day works best for you (given that there is still space available). Each class is one hour long and is taught in small groups of no more than 6 people at a time. All skill levels welcome! Class starts off with a 15 min warm-up consisting of jumping rope, stretching and finishing with push-ups and sit-ups. The fitness program is designed to help develop the attributes needed for the Jeet Kune Do practitioner. Then we move into the Jeet Kune Do training. 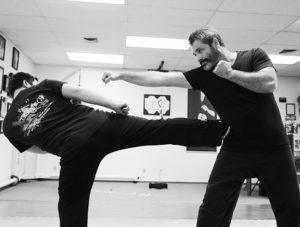 The curriculum focuses on the JKD four ranges of combat: 1) kicking 2) punching 3) trapping 4) grappling, along with various self-defense situations. We then finish up the class with some push-ups and sit-ups.